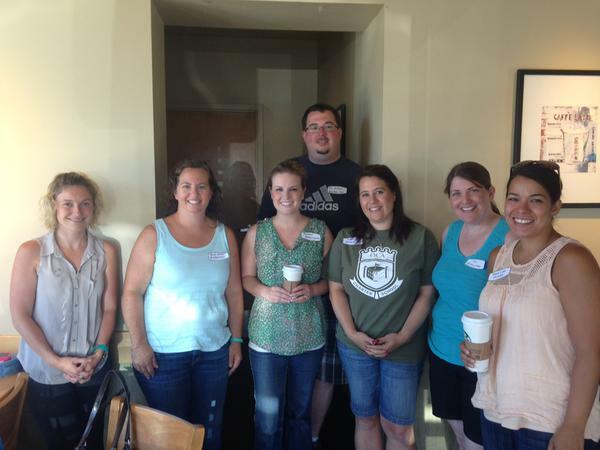 Today in school…well, today at a local coffee shop, teachers in central NJ met for a #CoffeeEDU. The idea behind a #CoffeeEDU, as originated by Alice Keeler, is that it is an opportunity to meet up in person — face to face — with members of your online Professional Learning Network (PLN). Our group today had representation from four different districts in the area. We represented elementary, upper elementary, middle, and high school levels. We were classroom teachers and instructional coaches. We were educators returning to the same assignment as last year and educators preparing for new assignments, buildings, or districts. We introduced ourselves…and shared experiences, concerns, and ideas all at our own pace over a relaxing cup of coffee. We shared contact information. We expanded our PLN. Like with a larger unconference, there is no agenda in place ahead of time, and there really is no one person in charge of the event. The event unfolds as the individual attendees see fit. Anyone can leave at any time. Anyone can jump in with an idea, a suggestion, or change the direction of the conversation. For more specific details, you can visit this #CoffeeEDU guidelines page. Some of the materials from Remind and Edmodo for our next #CoffeeEDU! And just like larger unconferences, there can be sponsors! Remind, for example, is one company interested in and dedicated to getting teachers to connect with one another. You can visit the Remind blog and find out more information about their limited time offer to sponsor #CoffeeEDU meet ups. Our group decided that we definitely wanted to meet up again! We are going to pick a date about a month from now and pick a different coffee shop for our next #CoffeeEDU. We divided up some small jobs to prepare for the next event (including each person trying to bring another educator with us). In keeping with the unconference structure, we won’t have a specific agenda in place for our next meet up, but we did say that we wanted to focus our meet up around a topic important to all of us, parents: parent outreach, parent engagement, parent support, etc. As of today, we are planning to meet up to talk about these topics. Some of us may bring related resources to share out, and some of us may prepare questions for when we meet. Some of us may think of something entirely different that we want to talk about. We may stick to the topic of parents the entire time, or we may pivot and spend our time on a different topic. That’s the beauty of the unconference and the #CoffeeEDU. I got to meet up and learn with a friend and colleague. …and I met some of my online connections in person for the first time. I gleaned new ideas for the coming school year from educators with different roles, different backgrounds, different experiences, and the common goal of being the best educators we can be for our students. We left a little bit more connected than when we arrived.